Inkerviews features the work of tattoo artists and collectors, as well as fine artists, in a series of interviews. With an exciting lineup already in place and endless more to come, I hope you will check back often to read about these incredible people and enjoy their visually stunning talents. Carlos with Lars from RancidTake a spin through the portfolio of Carlos Rojas and it won't take long before you are shaking your head, saying, "Wow, how does he DO that?" The signature black and grey portraiture style of Rojas is unmistakable and he can sling the color work with the best of them as well. His careful attention to detail and his dedication to the art falls right in line with the master he apprenticed under, Big Gus. I was fortunate enough to get to know Carlos and his adorable wife, Dawn, many years ago when Dawn and I got to compare and admire each other's Gwen Stefani ink. While I wear just one beloved treasure revering my No Doubt-Love days, Rojas has turned his wife's leg into a Gwen-themed masterpiece, making it into a sleeve of Stefani dedication. In fact, the Gwen portrait was his very first ever attempt at a portrait and wow, did he nail it the first time out! In addition to his ink work, Carlos is an accomplished painter. 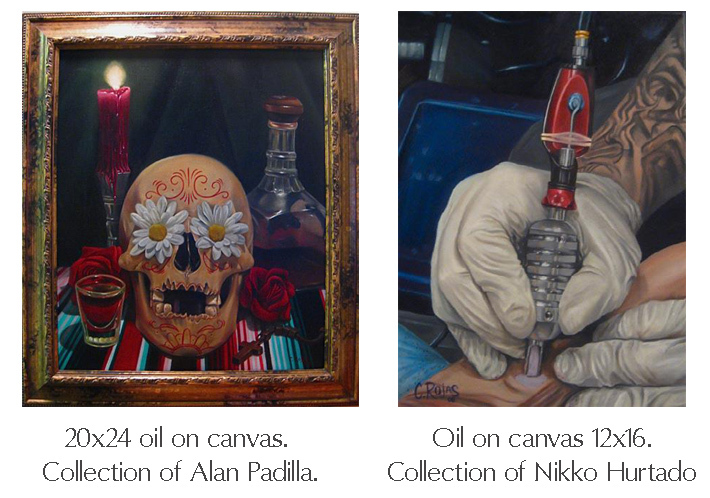 Each time I visit Mike DeVries' MD Tattoo Studio, I am fortunate enough to be positioned in the direct path of Rojas' paintings that hang upon the walls there; and believe me, I have stared at them for hours and couldn't be happier getting to do so. His use of color is brilliant and he has such a powerful way of connecting the brush to canvas. I got to talk to Carlos about his tattoo accomplishments and some exciting things he is doing in the painting world as well. How did you get started as a tattoo artist? Did you have a formal apprenticeship (if so, with who)? Were you an artist growing up? I did have a formal apprenticeship. I was getting tattooed at a really young age ( which I don’t advise), but I would bug the guy tattooing me to teach me how to tattoo, over and over again. Each time he would decline. Until one day he either gave in (or decide that I was too persistent and determined). Anyhow, he took a chance with me, and that guy’s name is Big Gus. I apprenticed for about two years, doing all the normal shop stuff, which eventually paid off. I used to draw a lot as a kid and really got into it in high school, taking basic drawing classes; which I failed (ha ha). I used to draw and recreate the stuff that was in the low rider art magazines. Your realism work is so excellent and you rock at both color and black & grey work. Which do you prefer to tattoo (if given the choice)? (ha ha) Thanks, you’re too kind. I guess it all depends on the piece, really. Some things I think look better in color and others in black and grey. I’m a lot more comfortable with black and grey, just because when I learned how to tattoo that is primarily the type of artist I wanted to become. But then again, if I feel I can pull it off in color, I’ll shoot for that. I like a challenge. You are such an incredible painter as well. Do you feel like your painting benefits your tattoo work (and vice-versa)? You have an amazing wife and family. How do you manage your time between your busy schedule and being a husband & dad? Is your wife involved in helping you with the business at all? To be honest, I think they suffer a lot from it. I’m totally consumed with work and art and at times I don’t think they get 100% of me. It’s sad, but I think it’s a struggle that all of us artists have to deal with. Our job isn’t like a regular 9 to 5 job, where once we leave work we can leave that at the office. We have to take our work home with us, draw, think of ideas, get random phone calls from clients telling us to squeeze them in, make art deadlines, ,etc. Fortunately they do understand and I try to make it up to them when I get the opportunity. I will tattoo my wife Dawn from time-to-time as well, to try to make it up to her. And then she will stop complaining until I need to schedule her in again. (ha ha). You recently hosted a successful art event, The 5x7 Show. Can you tell us about that and your goals for the event? Do you have plans to do more shows like this in the future? 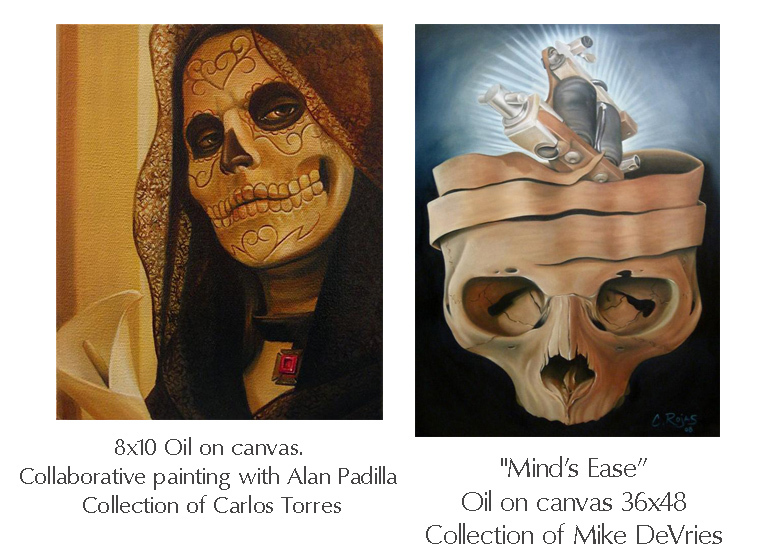 The whole idea for the 5x7 Show came to me one night as I painted with friend Alex Garcia. I was painting on a small 5x7 panel and I thought it would be cool if there was an art show theme of 5x7 pieces. Some shows have religious themes or skull themes, but I wanted it to be a size requirement theme. Click to view largerI thought that it would be cool if I could showcase 57 pieces from 57 different artists. Fortunately, I have become friends with a lot of these people, so it wasn’t too hard to fill up the list. It also tripped me out how some artists were more than willing and were thankful that I though of them. And I’m thinking, "It’s because of you that I want to become a better artist and you’re thanking me?" It is a bit more intimate to try to own a small piece of art from someone’s work you admire, and I thought it would be cheaper to buy one of these pieces. A lot of these guys put crazy amounts of hours into their pieces. It definitely blew my mind and my expectations for the show. My goal for the event was to hopefully inspire other people. I just wanted to bring people together and admire some beautiful art. I wasn’t trying to make money off of this or promote anything, but rather the artists and their work. It was a successful event in my eyes. A lot of people came down to show their support. Would I do it again? Probably not. I had weeks of stress and no sleep, to try and be on top of 57 artists to push them in getting their artwork in on time. It was so stressful. I would like to put together another art show, but maybe just a handful of artists next time. "Tragic Kingdom" 12x36. Oil on canvas. (ha ha) I don’t know if I’ve ever had a vegan version of anything, but I am willing to try. *To check out MUCH more of Carlos' magnificent portfolio, visit his myspace page here.